Zoë Skoulding, Lyrikerin, Kritikerin und Übersetzerin,lebt auf der insel Anglese. Zu ihren letzten Gedichtsammlungen gehört The Museum of Disappearing Sounds, Seren, 2013, und Teint: For the Bièvre, Hafan Books 2016. Sie ist Reader an der School of English Literature an der Bangor University in North Wales und bekam 2018 den Cholmondeley Award from Society of Authors für ihr Gesamtwerk und ihren Beitrag zur Lyrik. 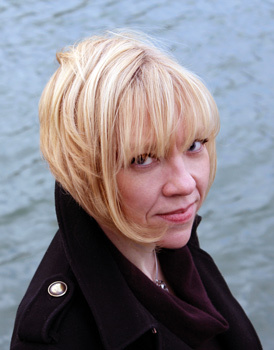 Zoë Skoulding, poet, critic and translator. She lives on the island of Anglese. Her recent collections of poetry include The Museum of Disappearing Sounds, Seren, 2013, and Teint: For the Bièvre, Hafan Books 2016. She is Reader in the School of English Literature at Bangor University in North Wales and received the Cholmondeley Award from Society of Authors in 2018 for her body of work and contribution to poetry. or a single grit in the eye. names of lovers surviving love. under the force of gravity or promises. on air caught in a windpipe. in the pitch glissando of speech. sweep up to settle in the dark, like snow. by the scratch of voices wearing it to sand. that used to be the future.